We recently took a look at the server logs for the GO service over the past 29 days (September 22 – October 21) and thought it might be interesting to share the most-used shortcuts and their aliases. While some people access these shortcuts by clicking on links embedded in our various web sites, the vast majority are directly typed into users’ browsers. Which shortcuts (one of these or others) do you find most useful in your normal day? 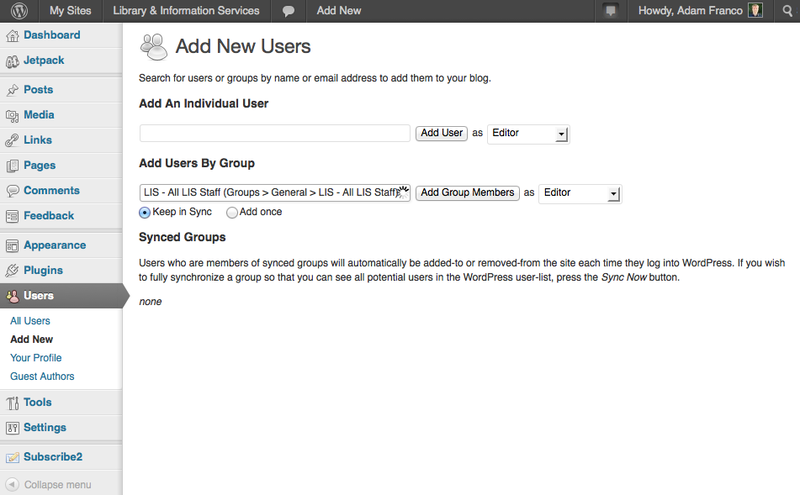 This entry was posted in Midd Blogosphere and tagged go, LIS Staff Interest, Web Application Development on October 25, 2013 by Adam Franco. This entry was posted in Midd Blogosphere and tagged Course Hub, Curricular Technology, LIS Staff Interest, Middlebury Community Interest, moodle, Web Application Development on October 10, 2012 by Adam Franco. This summer LIS added WebDAV support to Middfiles, a new feature that allows any Middfiles file or folder to be shared securely via a web-addressable URL. 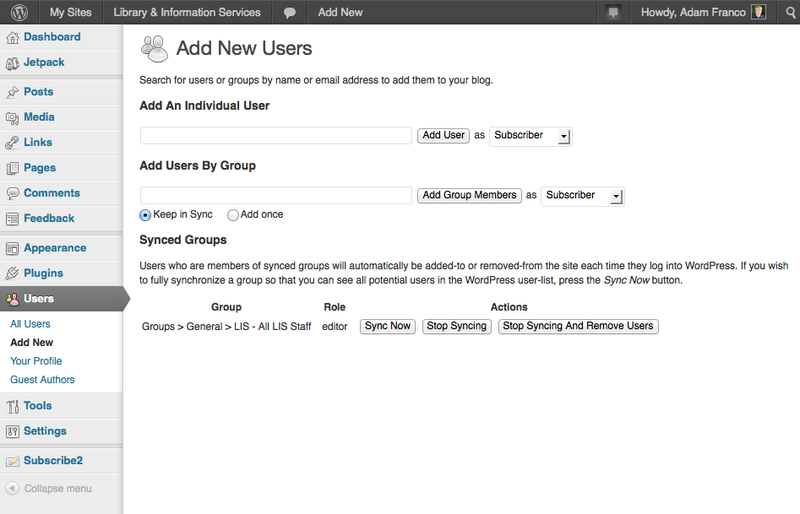 What this means is that you can now put links to files and folders into email, blogs, and websites. 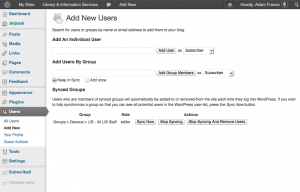 When a user clicks on the link they will be prompted to log in before their browser downloads the file. 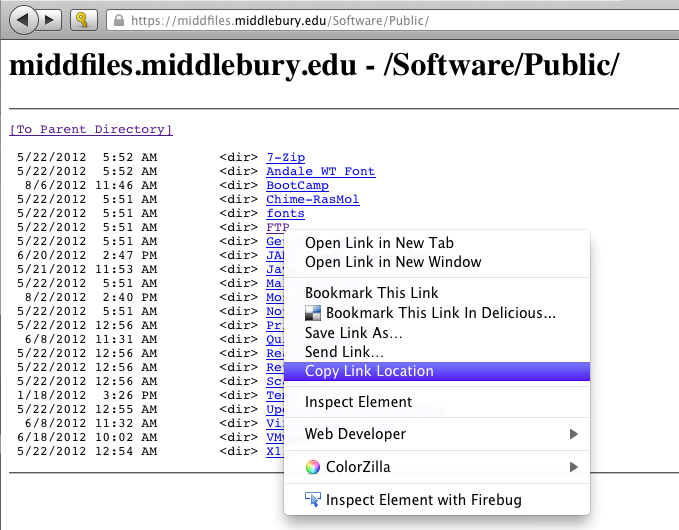 To try it out, go to https://middfiles.middlebury.edu/ and copy-paste a link to a file. 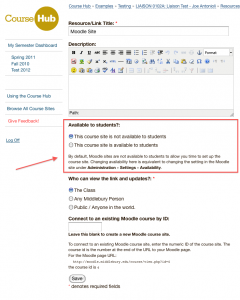 The other benefit of this new feature is that Middfiles can now be easily used as file repository by classes primarily using a blog or Moodle site. 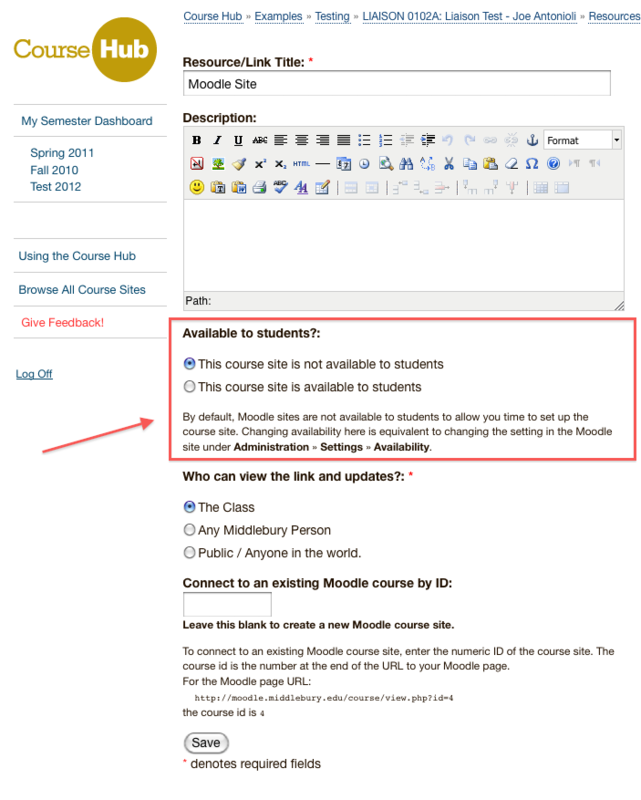 If you have large files to share that are too big for the blog or Moodle, just put them in Middfiles and copy-paste the https://middfiles.middlebury.edu/Classes/Fall12/…/… link to the file into the blog or Moodle site. As mentioned above, the Course Hub now automatically creates a “Middfiles Class Folder” resource when you put files in the HANDOUTS/ or SHARE/ sub-folders. This scan happens every few hours, so if you need the resource to appear more quickly, you can add it manually to the Course Hub. While LIS does not actively provide support for building static HTML websites, some instructors choose to build their own HTML websites and serve them out of the PUBLIC_HTML/ sub-folder of the class-folder on Middfiles. If any files are placed in the PUBLIC_HTML/ sub-folder a “Middfiles Public Website” resource will be automatically added to the Course Hub. 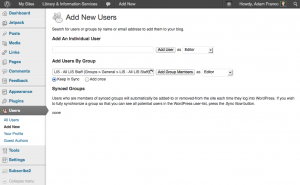 If files are moved or removed from the PUBLIC_HTML/ sub-folder the resource will automatically be removed. This entry was posted in Midd Blogosphere and tagged Course Hub, Curricular Technology, LIS Staff Interest, middfiles, Middlebury Community Interest, Web Application Development, WebDAV on August 16, 2012 by Adam Franco. 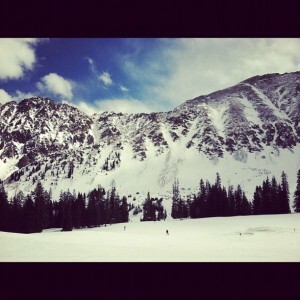 We (Adam and Ian) were in Denver, Colorado this week attending the annual US Drupal convention. In addition to attending sessions, we were able to connect with colleagues from other institutions including Amherst, Wellesley, Lawrence University, UNH, and CSUMB. We sponsored a “birds of a feather” session, with Amherst, to introduce interested parties to Monster Menus, a Drupal module that Amherst and Middlebury use to add a site hierarchy and manage permissions on our site. This session was surprisingly well attended by about thirty participants and we had a lively discussion about Monster Menus’ capabilities and limitations. We also attended multiple sessions on using Drupal in higher education to hear what people at other schools were doing with the platform. All of the sessions can be watched on the conference website (use the tabs across the top to browse each day’s sessions). Adam and I will highlight some that we found especially engaging, but if there’s one we missed that you think others would enjoy, please share it in the comments. Dries Buytaert: Dries is the guy who created Drupal and currently runs the leading Drupal consulting business and serves as President of the Drupal Association. His talk covered where the development team is focusing for the Drupal 8 release. There are three main areas of focus, (1) mobile compatibility, (2) modernizing the development API with the Symfony framework, and (3) improving the user interface for content authors. He announced a tentative release date of August 2013 for Drupal 8. Mitchell Baker: Mitchell is the “Chief Lizard Wrangler”, the head of the Mozilla project that produces the Firefox browser and Thunderbird email client among other efforts. She talked about the “Maker Ethic” and how the goal of Mozilla it to enable and promote the freedom to create, write, and publish. As she describes, the Firefox browser is but one product to enable this freedom and only one of the many projects Mozilla is engaged in. Luke Wroblewski: Luke gave a very entertaining presentation arguing that we now need to develop web applications for mobile devices first and worry about the desktop experience second. He presents amble data backing up this assertion, which is guiding the mobile-first goal for Drupal 8. Adding responsive designs for mobile interfaces to our platforms is a 2012 goal for the Web Applications Development workgroup here, so we’ll be doing a lot of work in this space shortly. Designing Fast and Beautiful Maps: This talk describes the TileMill and MapBox mapping tools, showing how you can transform a simple spreadsheet into an interactive map interface that can easily be added to a Drupal site (or any other website). Though this is probably not something that we’d use for the main campus map it looks like a great tool for one-off mapping projects including student research. By the way, if you have a map that you’d like us to feature on the site or in MiddLab, contact me and I’ll be happy to help you get that map online. I just want to edit a node and Five things we need to create an awesome experience for content creators: These discussions describe the initial thinking about the user interface for content creators in Drupal 8. While we won’t be moving to that platform until late 2013/early 2014, and some of the decisions about the platform may very well change by then, this is an early warning about what to expect. I should note that some of the features they discuss, like inline editing, are already available to us thanks to the Monster Menus module developed by Amherst. HTML 4 S – While We’re Waiting for the Revolution: We spent a lot of time thinking and talking about adding HTML5 features to our sites, but that’s not always possible due to assumptions made by the back-end systems as well as browser compatibility. This talk discusses the steps we can take to get “close enough” on HTML5 adoption and some of the pitfalls we’ll encounter that are specific to Drupal, though much of the information here is Drupal-agnostic. I’ll give a small warning that the speaker is quite colorful and animated in his speech. Real World Performance Analysis: How to Identify Performance Problems in Your Own Sites: This talk provides a good strategy for tackling performance issues in Drupal sites without wasting time on optimizations that won’t have a big impact. Keeping The Lights On – Operations and Monitoring Best Practices: This session is focused on practical tools and techniques you can use to keep “your fingers on the pulse” of your site, from availability to performance to security. Also, we were able to enjoy Colorado for a bit before the conference. Looking forward to next year in Portland, Oregon, or perhaps Munich or São Paulo later this year! This entry was posted in Midd Blogosphere and tagged Conference Reports, conferences, Drupal, DrupalCon, LIS Staff Interest, Web Application Development on March 27, 2012 by Ian McBride.